When Don Eldridge first ran for the Legislature in 1952, the Mount Vernon Argus identified him as the “favorite son” candidate in a crowded field of contenders for the Fortieth District seat. Well they might. Eldridge was born in Mount Vernon in 1919 and grew up in the community and personified the best of town life. He was deeply involved in community building as an active member and leader in the Junior Chamber of Commerce, YMCA, Rotary Club, various business organizations, and as a life-long member of Boy Scouts of America. 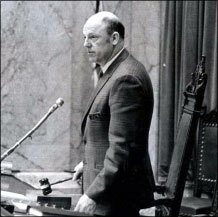 He also served on the Board of Trustees for Western Washington State College for a decade. When family tragedy diverted his chosen course from teaching industrial arts to running the family stationary store, Don immersed himself in the business and made it a success. Although busy with work, a growing family and business affairs, Eldridge heeded his father’s concern that there were not enough small business owners in the Legislature, representing that point of view. Previously involved only in precinct work and campaigns for others, Don was persuaded to run for office and went to Olympia in 1953 for his first session. He came back eight more times, rising in the ranks of the House Republican caucus until he was elected Speaker for his last two terms. 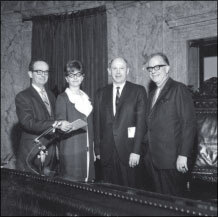 Although not a close member of the Evans inner circle, Eldridge worked with this group as caucus chair and Speaker to help promote their activist agenda. 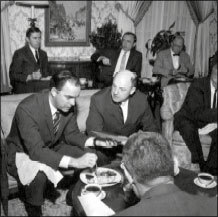 Acknowledging that he “had to hold his nose” on some of the more liberal measures, especially the promotion of the state income tax, Don nonetheless stumped the state with Evans and was deeply involved in the resurgence of the Republican Party experienced during the Evans years. 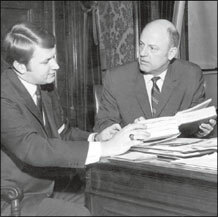 While relishing his role in “killing” legislation he considered superfluous to good government, Eldridge also made solid contributions in fashioning the new community college system and supporting higher education and keeping a businessman’s eye on Appropriations, unemployment compensation and other issues. 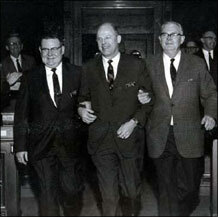 In 1970, Governor Evans appointed Eldridge to serve on the Liquor Control Board as part of his effort to reform the state’s handling of the volatile liquor issue. Almost instantly, Eldridge and other Board members were embroiled in controversy which shadowed most of his nine-year appointment. Still, these years saw the modernization of the agency and transformation of “Blue Law” attitudes to more permissiveness. After retiring from state service, Eldridge worked with various business groups to address labor relations issues, served briefly on a commission to redistrict Congressional districts and developed his own property management business. His growing family of grandchildren and great-grandchildren keep him involved in their sports and other activities. He has recently been honored with one of Scouting’s highest honors, a Distinguished Eagle award. "Some Have Misjudged Speaker Don Eldridge"
"Carrying Water to the Elephants"